When it comes to family history research having a black sheep in the family can be a boon. Legal records offer another route to find ancestors who inexplicably manage to avoid the census. The bureaucracy of the legal system gives us access to information that is often lacking in other records. There are usually physical descriptions of prisoners and a myriad of other details such as occupation, marital status and last known address as well as place of birth and age. In the 19th century Irish men and women living in Britain were three times more likely to find themselves in front of a judge or in jail than the native population. While this was unlucky for them it is very fortunate for those of us in search of ancestors in Britain. The legal system of the time was quite harsh and most crimes were petty offences, small thefts, drunkenness and vagrancy. Sentences in the 19th century varied wildly, the concept of crime was very different to ours: a man beating his wife could get less time than someone stealing a small sum of money. Many sentences were a week to 14 days long. During this period of a prisoner's sentence the food rations were at their worst. This was to deter the poor from committing petty crimes in the hopes of a short term prison sentences to get access to food and shelter. Many of the Irish law-breakers can be found in the Admiralty records of the Hulks. Pressure on the traditional town jails and the decline of transportation to America resulted in old naval ships being used as prisons from the late eighteenth century. The conditions on board ship almost defy description. The ships were moored in rivers and along the coast and packed with prisoners. The prisoners formed work-parties during the day and at night were chained below decks. In the dark, damp and gently swaying belly of the ship hundreds of prisoners stayed for years at a time. 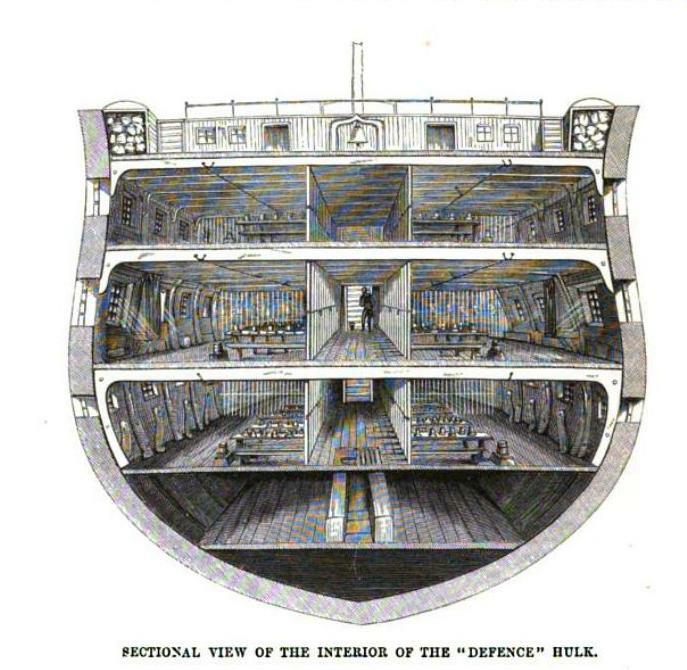 This image from The Criminal Prisons of London, and Scenes of Prison Life (available on Google Books) gives a real sense of the cramped space and claustrophobic atmosphere below decks, even without showing 500 men crammed into the space. In the dimly lit, airless space diseases like typhus spread rapidly, a single outbreak could kill up to a quarter of those on board. Other details include the prisoner’s marital status. Several Irishmen are listed as having wives and children. Denis Donovan, a plasterer aged 30, from Cork city has a wife and eight children in one record, whereas another indicates he has 2 children. He was sentenced to 14 years. His crime was to have taken payment knowing the bank note to have been stolen. Another intriguing record set is the Criminal Petitions. This series comprises letters sent by family members to plead on behalf of relatives convicted to have their sentence overturned or reduced. One letter in the collection concerns Irishman Owen MacGreal from Leitrim, convicted of fraud and transported, for life to New South Wales, Australia in 1834. The letter, a plea from his wife and friends, describes how the family has been left destitute without a father “the memorialist [person making the petition] has a weak and helpless family of female children without any means of support”. The petitioners ask that Owen be released so as he can earn a living in the colony and support his family back in Ireland. Records found on findmypast confirm his arrival in New South Wales on-board the ‘Forth’ on 3 February 1835. Further research showed that he was granted a ‘ticket of leave’ in 1843, nine years after his conviction. A ticket of leave would have allowed Owen to work for wages as long as he reported to the local police on a regular basis. It is unknown what became of his family back in Ireland. These are just some of the stories that can be told using the new Crime, Prisons & Punishments records, search them now, maybe you'll discover a black sheep you never knew about.